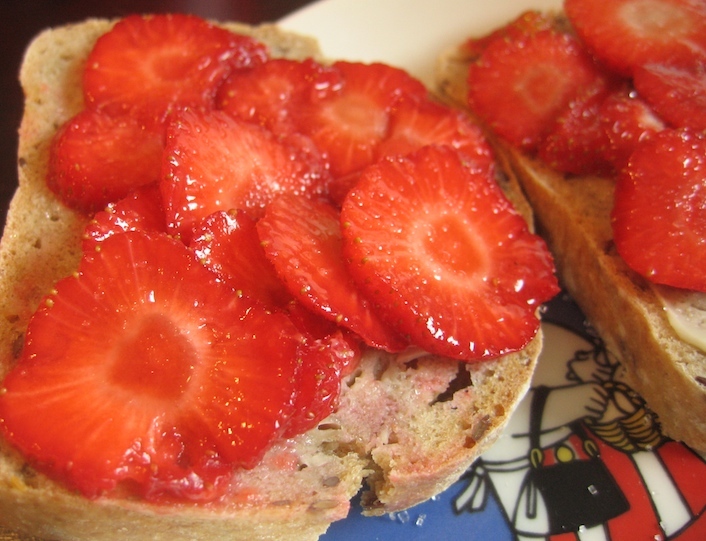 Strawberries are probably the best thing about summer and to preserve them is a way of having that wee bit of summer all year round. I have made tons of jam this year, it’s my very first time trying, but it’s so easy, it’s something I’ll be doing every year! Add as many strabwerries as you have to a fitting pot. 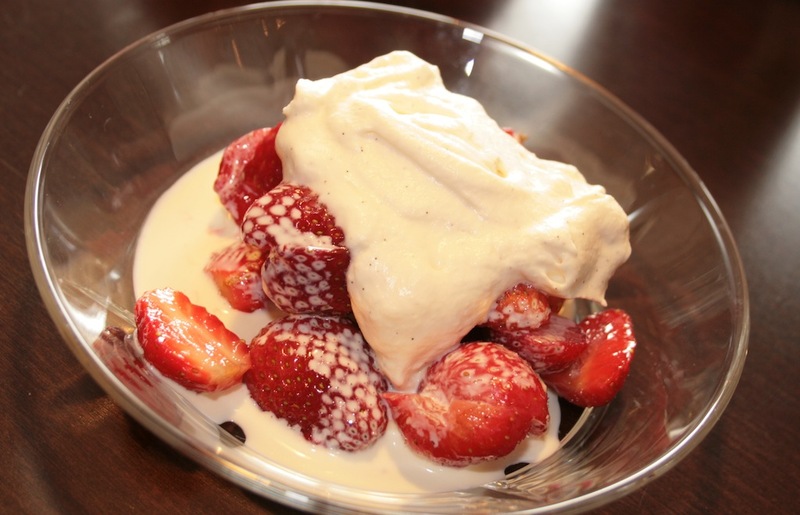 Strawberries can be fresh, but you can also buy frozen berries. No need to defrost. Add to the pot and place the pot on low heat. Put a lid on and go do whatever you want for half an hour or so. Come back and take the lid off. This will send those wonderful odours travelling around the house giving you memories of summer and sunny days. 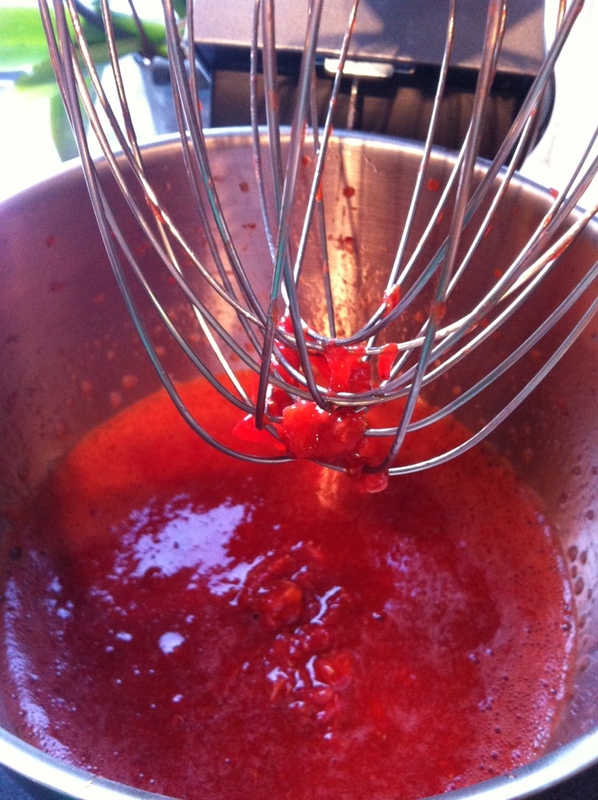 The strawberries will turn into mush, a lovely pinkish-red mush. 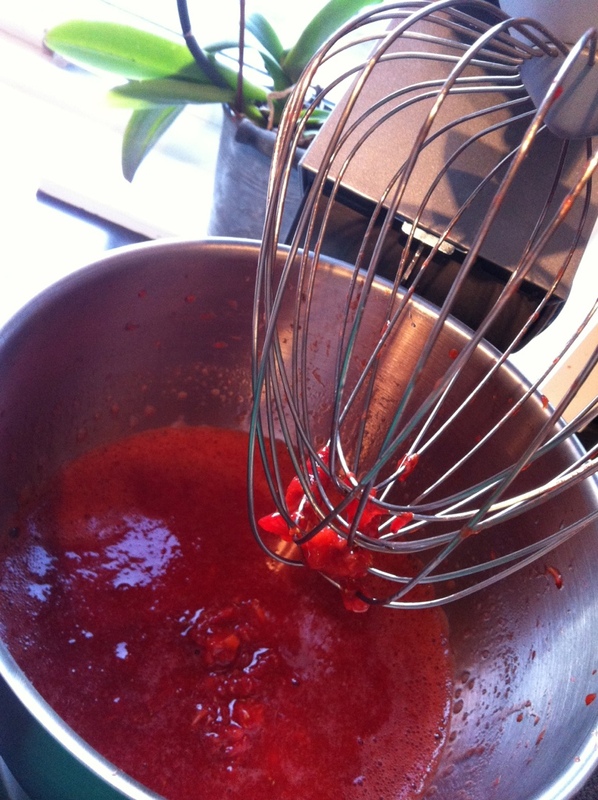 For every pound (half a kilo) of berries you have add about 3/4 of a teaspoon worth of agar. After adding the agar you let the mush boil for about two minutes (turn the heat up and make sure to stir often) before you turn the heat way down low again. Add as much sugar as you (or any other type of sweetener) but make sure you taste while adding. You’ll never know just how sweet the berries are without any added sweetener, if you don’t taste! Add the sugar and let it dissolve (it will do so almost immediately). Leave the jam in the pot and wait until it reaches room-temperature before placing in the fridge. You can also can the jam or freeze it. And what an easy way to have home made fresh jam any time of the year! Enjoy! A bird told me (or I came across it somewhere on the great interwebz) that strawberry and mango compliment one another quite well. 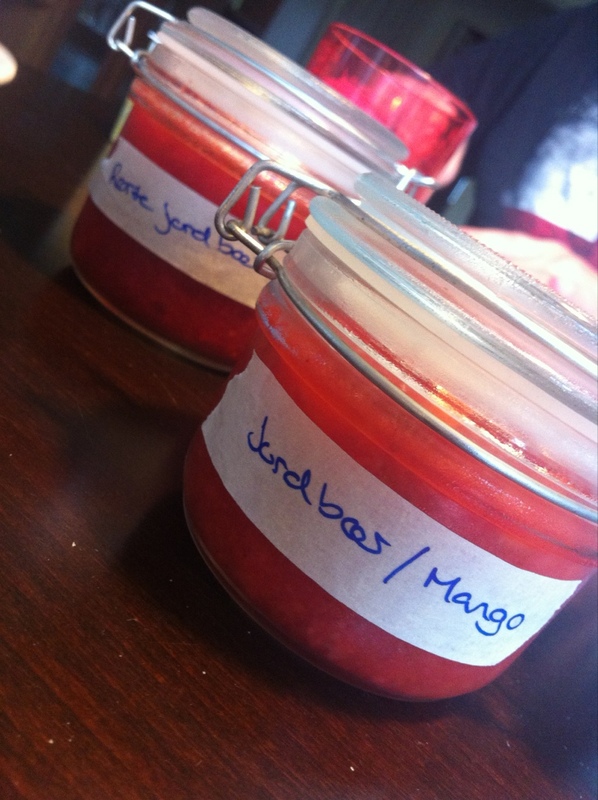 It was during my first experiments with jam production this summer that I decided to try them together. It’s so easy, and sooo good, that you really should consider doing the same. 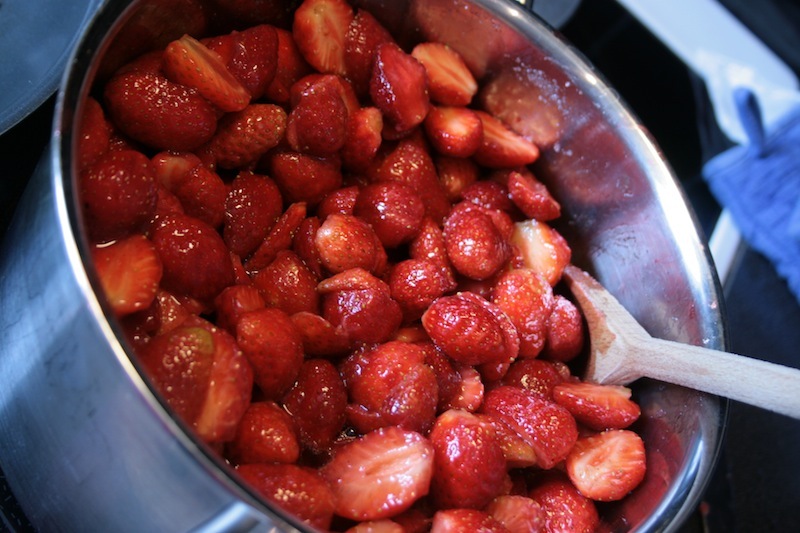 Rinse the strawberries and add them to a pot. Slice and dice the mango, see how here, and add to the same pot. Put a lid on and low heat to slowly warm the fruit and berries. 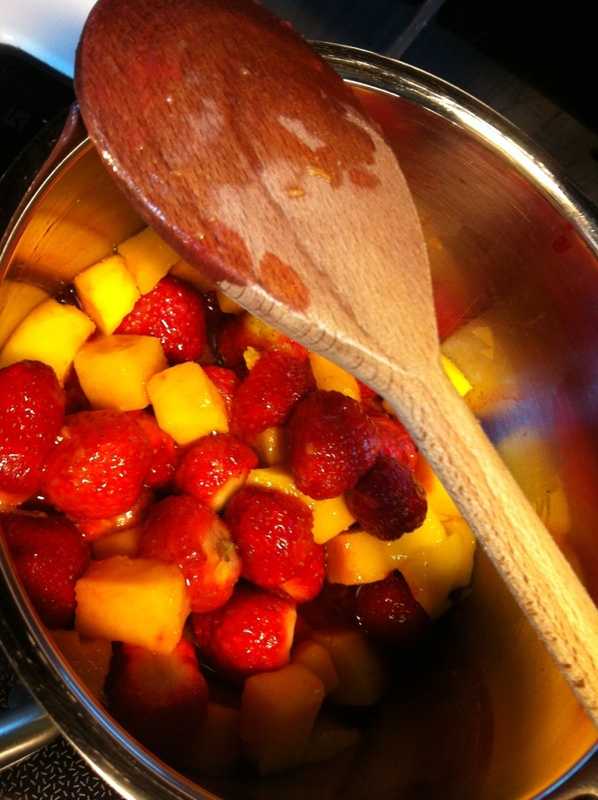 Slowly bring the pot to a boil and watch how the strawberries and mango become one. The mango is so sweet that there’s no need to add sugar, but if the berries are a little sour, or the mango not quite ripe, add a bit, but make sure to taste! Add a squeeze of lemon for preservative reasons. After the jam has boiled for a wee bit (if it has boiled, it is done, but mine is usually left to itself for some minutes because I’m busy doing something else) then mash it gently with a potato masher. The jam is just divine. 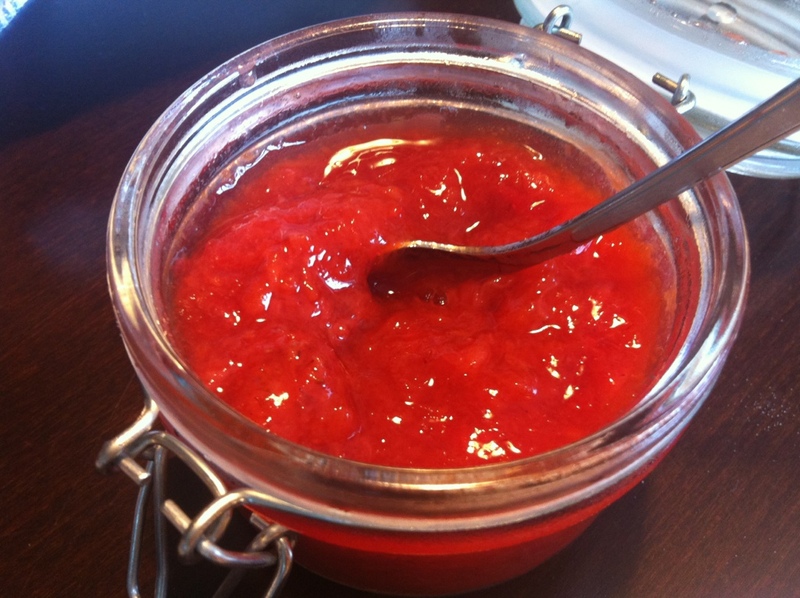 It’s sweet (with no added sugar) it’s not runny (much like plum jam) and it tastes of summer and long summer nights. Enjoy! I read up a bit and found agar. We did some experimenting with that, but were quite disappointed. And the jam we wanted to make was supposed to be quite runny, so we didn’t really need it. We then went directly to the source. 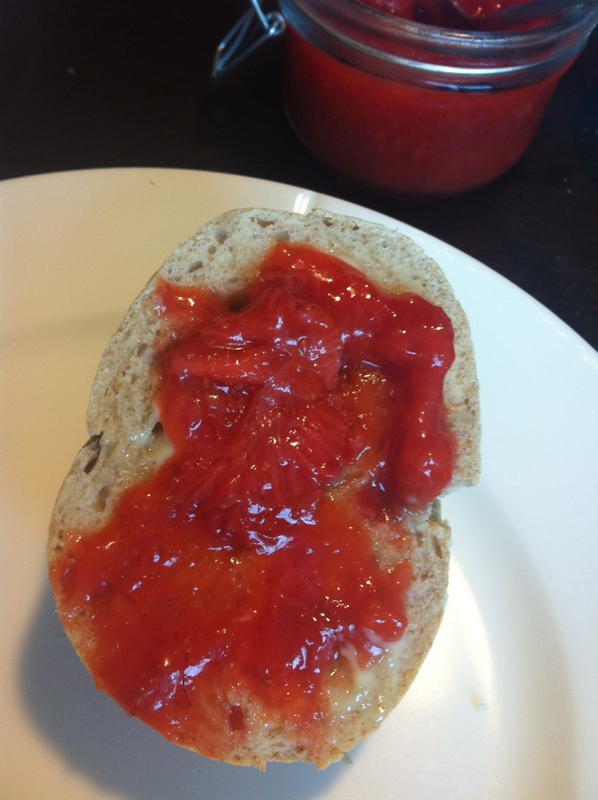 Home made, non-cooked, strawberry jam is supposed to be lumpy. It’s supposed to be sweet without being to sweet. And it has to taste like freshly picked strawberries. A normal mixer will make it into smoothie. But mother-in-law showed me the whisker! And that’s all you need to make the jam! Simply dice the strawberries (cut them in half or into four), put them in a bowl and whisk them together with a bit of lemon juice (this will slightly increase the life expectancy of the jam). Find a big spoon and add a little jam to a smaller spoon (the taste-spoon) and taste (this way you don’t have to put your fingers in the jam, nor add your saliva to the mix). Strawberries vary much depending on type, season, weather etc, so you don’t know how much sugar you want to add unless you taste it. You’ll be amazed at how little you need at times. I freeze my jam in smaller boxes that will easily disappear after a few days, and that are also easily defrosted in the fridge. That way I can whenever I want add a little taste of summer to the table in during the coldest winter days, with all the goodness of freshly picked summer strawberries. Enjoy! It seems the summer will soon be taken over by autumn. It is sad, but true. Fortunately I have had a good summer and am ready to taken on the many joys of autumn. However, Son and I came across a fruit vendor (or close to that at least: a man selling berries off a table near a gas station) who still sold Norwegian strawberries. I’m not much of a nationalist regarding strawberries, but I prefer buying local produce rather than strawberries that have barely had time to ripen before they are shipped across a continent to be placed in my local supermarket. I was surprised to see someone still sell strawberries, as I thought the season was over. The berries weren’t as sweet as they have been earlier in the summer, neither were they as red or juicy, but they definitely served their purpose well: the last local strawberries of the summer of 2011. We bought about a kilo worth of berries. Some we put on sliced of bread and sprinkled with a wee bit of sugar (just as much for the crunch as making them sweeter) the rest we ate straight from the box. This summer I’ve tried strawberries from both Norway, Sweden and Denmark, and it is impossible to pick a favourite. 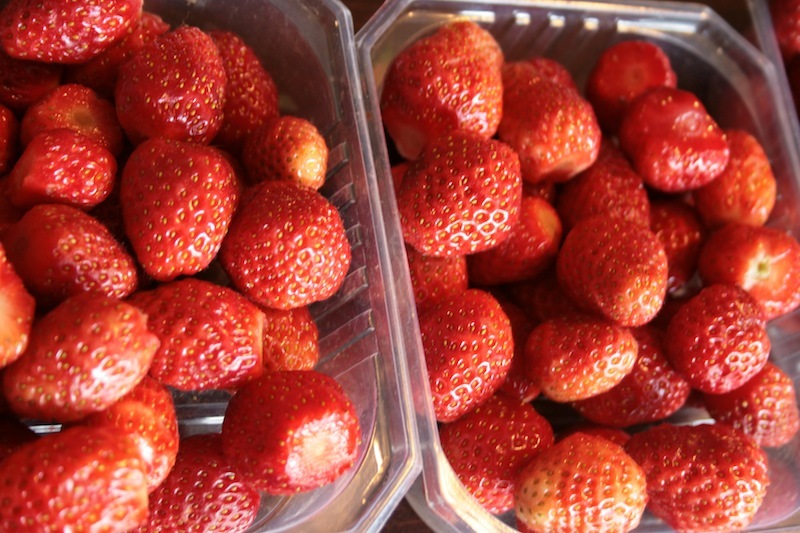 However, they are all a lot better than the importer berries from Belgium and Portugal (there are the most common imported strawberries in Norway). I think I could live on strawberries alone during the summer, and some days I have been close to eating nothing but strawberries. Now, however, I am happy to wait some ten months before I again taste the delicious berries. Usually when I start to let go of a season, and start preparing for the next, the weather god put on their sarcastic faces and completely surprise me. Some days ago I talked to someone about the weather, and we both agreed that autumn was just around the corner. Consequently the next days were the sunniest days we’ve had in a long time. There is a bit of a cold breeze though, and the shade is no longer as pleasant as it has been. I’m sitting outside at the moment, showered in the warm rays of the sun, but I’m still a bit cold, despite jeans and a sweater. I’ll pretend it’s still summer for a few more days though.